Traveling gives one the opportunity to see an abundance of perspectives, varying among location and wholly different than your own. Traveling enriches my own perspective by providing more dimensions to the world; as a result, my life is more abundant. Every winter my fiancé and I take a trip to recharge. In addition to being a photographer, I’m a farmer. Winter is the season of rest and renewal: the time when the fields go to sleep and the soil rests, the time when I slow down and seek inspiration; a time when I try to meet people different from myself and understand the world that others live in. The winter is incredibly important to how I’ve structured my life and traveling is a huge part of that. Last winter, Ross and I travelled to India. India had long been on my list of destinations for several reasons, not the least amongst them being the ubiquitous, bold colors , the mindfulness of the culture, the chaos of the streets, the complexity of the society, and the connection to nature. The tea plantation we visited in Wayanad was a break from the cities we saw and an adventure into a slower pace in the rural countryside of southern India. For several days, we were isolated atop a hill in the tea plantation. We interacted with those that worked at the plantation - learning about their life, eating the regional cuisine, touring the factory and the grounds. Apart from the conversations we had with those folks, the days were quiet. Perhaps a hike amongst the tea trees or reading a book on the veranda. And plenty of moments to connect with our inner selves, enjoy each other, and let nature speak to us. The tea plantation was an observance in balance, the quiet in our otherwise busy trip. We desire to go and see and experience all a place has to offer. Also important while traveling is to listen to what your mind and body need. As a natural introvert, stillness and isolation are large parts of understanding myself. At home, mornings are my most treasured time. I take time to wake up, make it a point to see the world before I check my email or phone screen, and take a long walk with my fiancé so that we can meaningfully connect before our work whirls us away. My favorite photos of our trip are the images of mornings. 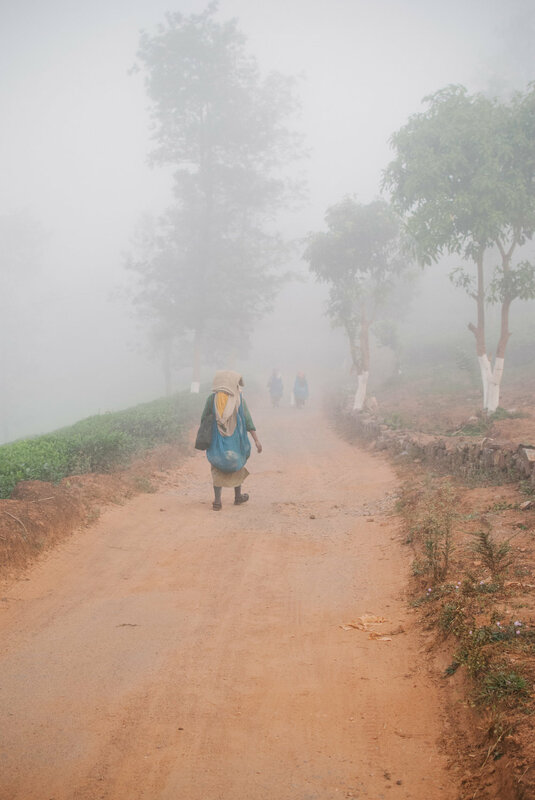 A cup of tea in the early hours, the rise of the fog from the fields, the trek of people walking to begin a day’s work, the warm glow of morning light. Images that remind me to slow down and that every morning is sacred. Photography is a constant exercise in noticing the small things. The way light dances through the trees, the quick emotion that flashes across someone’s face, the details of the environment. Photography is an act of not letting those things go unnoticed but rather being perceptive and capturing those moments. To approach life slowly and meaningfully allows one to notice the details or see the mundane in a new and beautiful way. When we slow down, our lives are richer. Even still, traveling is my most indulgent act of self-care. As a woman with my own business, time is often my most valuable asset. Every minute I wait to respond to a potential client is a minute a competitor may make a meaningful connection and be hired instead. My absence could mean a client has an unanswered question or delayed plans. Even if we have an out-of-office reply on, it is a challenge to remind ourselves of the importance of self-care—that vacation is attributing to our lives not taking away. India spoke to me to so many levels. Most importantly perhaps was an understanding of how to exist within chaos. The world around is happening in fast forward and all your senses are in overdrive – the colors, the sounds, the smells, the tastes, the textures. I’ve spoken with many people who imagine India to be “too much” but I learned by going with the current instead of against it, my internal being was so much calmer. Blog + Images by Leah Puttkammer. Leah owns Gray Kammera Photography, a wedding and portrait photography business based in Nashville, TN and Washington, D.C. She enjoys capturing light in unexpected places, traveling the less-traveled road, and adventures with her cattle-dog pup Ruby. Leah Puttkammer owns Gray Kammera Photography, a wedding and portrait photography business based in Nashville, TN and Washington, D.C. She enjoys capturing light in unexpected places, traveling the less-traveled road, and adventures with her cattle-dog pup Ruby.